If you want to track your heart rate for exercise or health, but don't want to mess with a separate heart rate monitor or pulse monitor, the Azumio Instant Heart Rate app for iOS, Android, and Windows is a convenient solution. Just place a finger over the camera of your mobile device, and it detects your pulse from the change of color of your fingertip. Within 10 seconds, you have a measurement. With the paid version, you can store your results and view graphs. You can also share your results via email and social media. The app works best with a mobile device that has an LED flash. While you can use it with devices that don't, it only works with them in a brightly lit area, such as outdoors or next to a window. To use it, first set your age and gender so it can calculate your heart rate zones. To take a reading, just open the app and place your finger over the back camera of your device. It even works well if you have a protective phone case. You will see the heartbeat graph as it detects the color change in your fingertip. Once it gets a steady beat, it measures for 10 seconds and then gives you a final reading. If the heart rate is below an exercise heart rate, it shows it on a resting heart rate analysis indicator. If it is above the threshold to be an exercise heart rate, it displays it with your percent of maximum and which heart rate zone you are achieving. 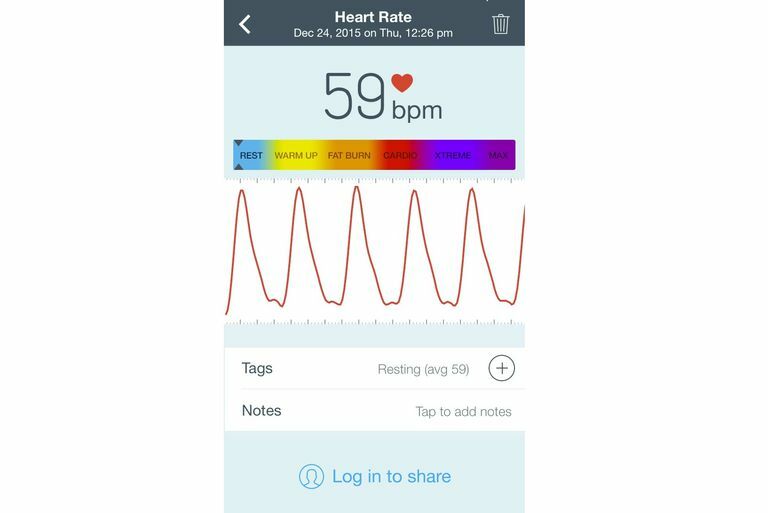 With the paid app rather than the free version, you can store your heart rate readings and view them on a graph. This can be handy to use during an exercise workout, taking the readings at various times and viewing the results. You can share your heart rate measurements via email, text message Twitter, Facebook. Besides taking your heart rate on demand, you can also take a heart rate recovery fitness test to help measure your fitness progress. You get your heart rate up to 70 percent of maximum, and it takes a few readings to see how fast your heart rate recovers towards normal. This app has been around for several years and during that time more and more devices have the built-in LED flash that allows it to perform better. You can use the app while you are out walking and won't have much trouble getting a good reading. For more vigorous exercise, you may want to stop and march in place while taking a reading, as you would if you were taking your exercise pulse. This app is not a continuous heart rate monitor, so if you want truly instant readings throughout a workout, you need a heart rate monitor with a chest strap sensor. There are now many heart rate monitor straps available that use Bluetooth to transmit data to a phone app or a fitness wearable. In addition to the free app, there is an Instant Heart Rate+ Heart Monitor version for just a few dollars. That version allows you to store your heart rate readings and view them on graphs. This is well worth the few dollars charged. One unfortunate thing with the basic app and the low-priced paid version is the frequent pop-ups for you to subscribe to the premium version. You can subscribe for one month to 12 months and the subscription automatically renews. The subscription includes a health bundle with a stress test to measure and track your stress level and overall fitness, healthy lifestyle tools, and printable heart health insight reports. You can choose different health programs geared towards weight loss or getting more active. This app is a very useful addition to your mobile phone. You can check your resting heart rate in bed in the morning or your exercise pulse on demand. The readings are consistent and reliable. In fact, the app touts that it is used by Standford cardiologists in clinical trials. The free app and the low-priced paid version without a subscription are far cheaper than any pulse monitor device or fitness wearable. But it is no substitute for a dedicated heart rate monitor with chest strap for accurate, continuous heart rate measurement.